I am a sucker for train rides. In 1998 I decided to take a long weekend trip to the famous Copper Canyon in Mexico. On a Thursday I set out early in the morning, taking the plane journey from Buffalo, New York to El Paso, Texas. When I arrived in El Paso I crossed over the border to Juarez, and went to the bus station. There I bought an 11:00 pm bus ticket to Chihauahua. Yes, the place famous for the small dogs. It was going to be a five hour bus ride, so I could take a nap. When I arrived there, it was still dark. I had no choice but to get into one of their waiting taxis, and trust them to get me to the train station. Yes, a little scary. When I arrived at the train station, it was not open, and still dark. I just had to hang around outside like some others. Yes, still scary. In a couple of hours, daylight came and I was on the 6:00 am train, Friday morning heading westward to the Copper Canyon, and feeling a lot safer. 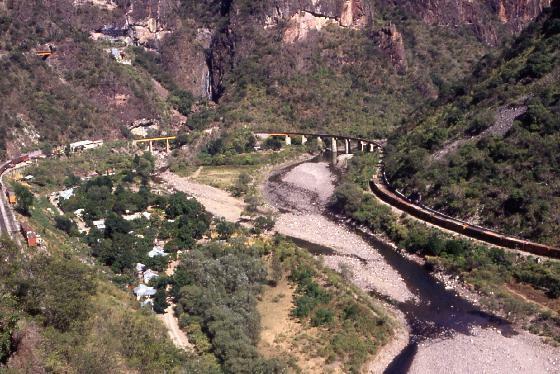 If Mexico's Copper Canyon, Barranca Del Cobre, is an astonishing spectacle - and it is deeper and wider than the Grand Canyon - then the railroad that serves it is hardly less remarkable. Completed in 1961 and named El Ferrocarril Chihuahua al Pacifico, the line needed 86 tunnels, 36 major bridges, and assorted spirals and horseshoes to wend its 405 miles (652 km) from Chihuahua City to Los Mochis near the Pacific Ocean. The railroad has an intriguing history. Though it has even older roots, it was effectively begun in 1900 by North American businessman Arthur E. Stillwell as the Kansas City, Mexico and Orient line in hope of linking the Midwest with the Pacific. Six decades later, the last rails finally were laid through the Sierra Madre Occidental by the government of Mexico to finish the line. Though the railroad doesn't actually enter the Copper Canyon, it passes just a stone's throw from the rim at Divisadero and does traverse other canyons. Amid miles of beautiful scenery, with towering crags and cascading rivers punctuated by tunnels and other excellent performances of railroad engineering, one location stands out, called Estation Temoris. Excellent rail road engineering here. The line drops into the Santa Barbara Canyon using three levels of track, turning at one end in a tunnel (aptly named La Pera, "the pear," with its 180-degree turn) and at the other end on a graceful curved bridge across the Rio Septentrion. The most economical trip is to take the regular daily train between Chihuahua and Los Mochis. In July 1999, as part of a countrywide initiative to privatize the railroads, the Copper Canyon line was sold to Ferrocarril Mexicano (or Ferro-Mex), a wholly owned subsidiary of Grupo Mexico (which also owns mines served by the railroad) and the Union Pacific railway. The new owner has upgraded passenger service, now offering Express Class with refurbished cars and light meals on board. At midday the eastbound and westbound trains meet at Divisadero, where canyon views are superb and the platform teems with vendors hawking crafts and food. Along the route, at certain places you can see where there had been de-railments. At the bottom of the ravines, you could see wrecked railway cars. A little scary. I kept my fingers crossed. It was not raining. Hopefully no mud or rock slides that would cause the railroad to give way. After a whole day on the train, going through Creel and Divisadero, darkness came around 6:00 PM. It would still take three hours to get to the end at Los Mochis, on the Pacific coast. I decided to get off sooner, at El Fuerte and get something to eat and a good night's sleep. Next morning, I picked up the train again, this time heading back east on its return trip. When we arrived at Creel, I decided to get off and spend the afternoon there. There were lots of handicrafts for sale, made by the local Tarahumara Indians. After a good night's rest I spent Sunday taking a trip down into the canyon in a station wagon, where there were lots of good canyon scenery. I saw lots of cacti, mostly prickly pear cactus, which the locals cook and eat. I notice it now in our food stores sometimes. On Monday morning, I took the bus back to Juarez. Along the way some tall, blonde, blue-eyed people got on and off the bus. They were Mennonites, who had settled there in Mexico many years ago, and co-existed well, apparently with the native Mexicans. In the evening I crossed back over to El Paso where I stayed the night. On Tuesday morning, I headed back to Buffalo, by plane, with my Copper Canyon train ride mission accomplished, and much appreciated. RVs are not permitted on the train any more.